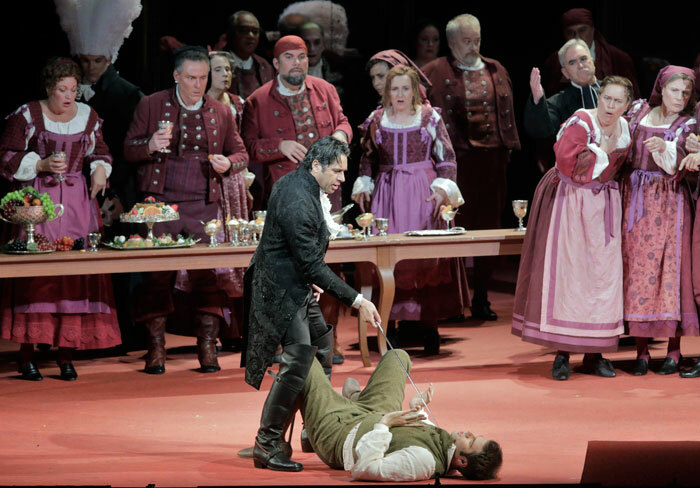 Opera is where it’s all happening in San Francisco this weekend! Not only will San Francisco Opera’s production of Don Giovanni be screened live at AT&T Park tomorrow, but the final performances of the Company’s Summer Season – Verdi’s Rigoletto and Puccini’s La Bohème – take place at the War Memorial Opera House on Saturday evening and Sunday afternoon respectively, and on Sunday evening Classical KDFC broadcasts San Francisco Opera’s 2016 production of Verdi’s Aida. 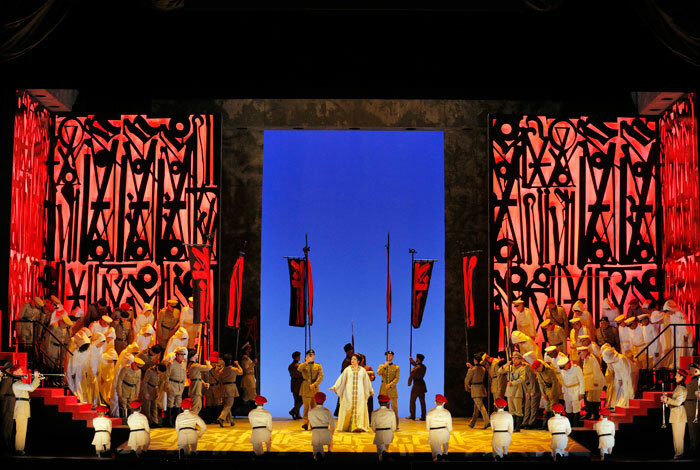 This staging of Aida – a co-production with Washington National Opera, Seattle Opera and Minnesota Opera – was directed by Francesca Zambello, and the broadcast features soprano Leah Crocetto in the title role, and tenor Brian Jagde as Ramades. Both made their role debuts in this production. Set in Egypt at a time of conflict between the Egyptians and the Ethiopians, the opera tells the love story of an Ethiopian slave girl, Aida, and Ramades, a captain of the Egyptian guard. To complicate matters, Adia’s mistress, Amneris, is also in love with Ramades, resulting in a tale of love, duplicity and, ultimately, tragedy. The San Francisco Opera Orchestra and Chorus (Chorus Director Ian Robertson) is led by Company Music Director Nicola Luisotti, an enthusiastic proponent of the Italian operatic repertoire. The radio broadcast of San Francisco Opera’s Aida takes place on Classical KDFC on Sunday evening, July 2, at 8.00 pm. Visit www.kdfc.com for tuning frequencies, or listen online. This is the week in which San Francisco Opera and AT&T provide the people of San Francisco and the Bay Area with a wonderful annual gift – the broadcast of an admission-free live performance direct from the stage of the War Memorial Opera House to the big screen at AT&T Park – and this year, the featured opera is Mozart’s Don Giovanni. 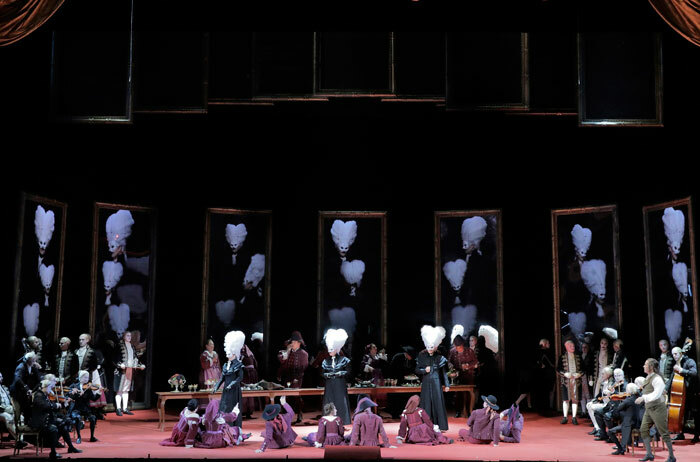 Based on the tales of the fictional 17th century libertine Don Juan, the opera tells of Don Giovanni’s exploits in his desire to seduce any woman he chooses, but in the end, his bravado brings about his downfall. 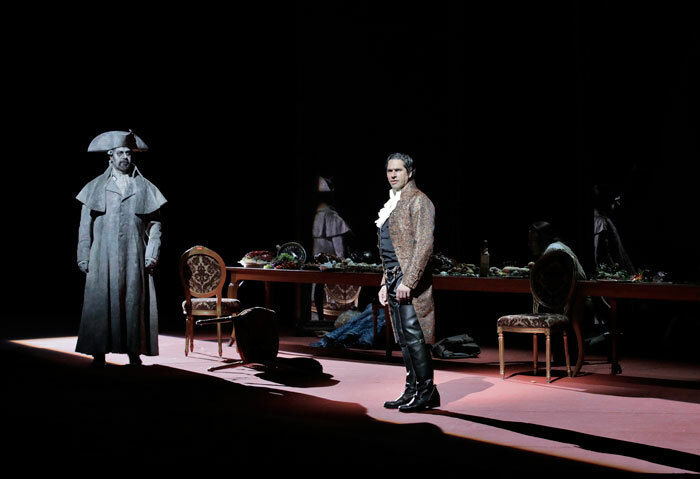 In this production, sung in Italian with English subtitles, the role of the shameless womanizer is sung by Italian bass-baritone Ildebrando D’Arcangelo, in his first performance for the Company. In another debut appearance, soprano Erin Wall sings the role of Donna Anna, soprano Ana María Martínez sings Donna Elvira, and bass Erik Anstine is Leporello. 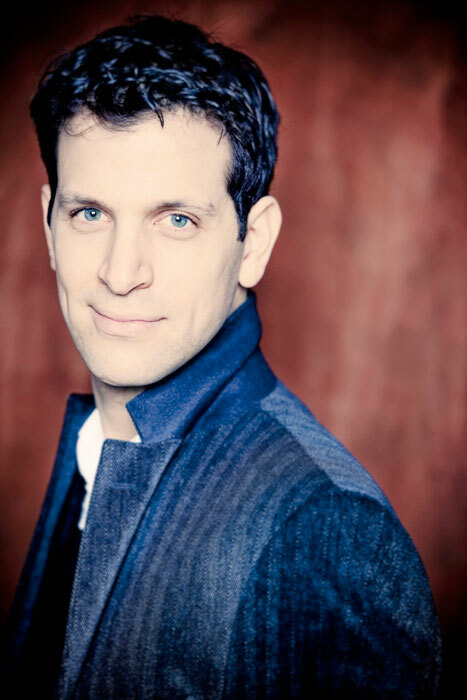 Leading the San Francisco Opera Orchestra and Chorus (director Ian Robertson) is the illustrious French conductor, Mark Minkowski, making an eagerly-awaited debut with the Company. Visit www.sfopera.com for more information, and follow this link to read a preview. 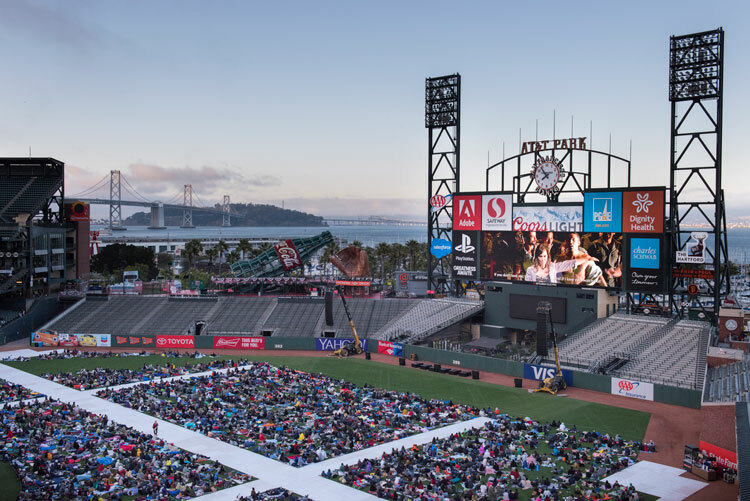 If you’d like to celebrate the joy of opera this Friday, make an evening of it with a group of friends, or treat your family to a grand experience, and head for AT&T Park. The performance starts at 7.30 pm – and you can either sit on the field or in the stands. The gates open at 5.00 pm and if you’d like to go early to get a good spot, register on this link. Classical KDFC‘s Dianne Nicolini and Hoyt Smith will be your pre-show and intermission hosts, and Beach Blanket Babylon’s Tammy Nelson will lead the crowd in a rendition of Take Me Out to the Opera. Just because the end of the season is upon is, Michael Tilson Thomas and the San Francisco Symphony don’t see that as a reason to gently slide into the summer. Indeed, their final performance is Romeo and Juliet – Hector Berlioz’s Dramatic Symphony for chorus and solo voices, inspired by Shakespeare’s tragedy, with a text by Émile Deschamps, after William Shakespeare. Appearing with the Symphony are the Grammy Award-winning San Francisco Symphony Chorus (director Ragnar Bohlin) and widely acclaimed opera stars Sasha Cooke, Nicholas Phan and Luca Pisaroni. 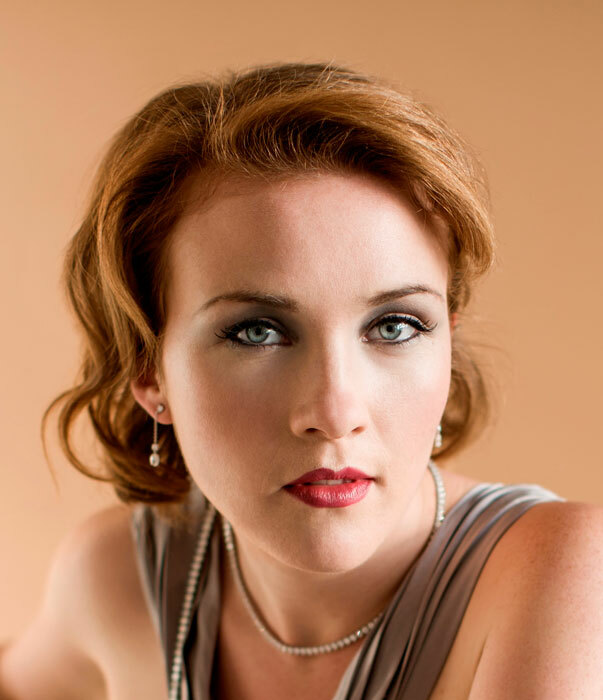 Sasha Cooke, the “luxuriant, lustrous mezzo-soprano” (New York Classical Review), is a firm favorite here, having performed a number of times in productions by both the Symphony and SF Opera. Ms Cooke sang in the Symphony’s staging of Mahler’s Das Lied von der Erde last year, and appeared twice with San Francisco Opera in 2015 – in Wagner’s Die Meistersinger von Nurnberg and Berlioz’s Les Troyens. Highlights of tenor Nicholas Phan’s forthcoming season include debuts with the Minnesota Orchestra in Bach’s Christmas Oratorio, and the Orquestra Sinfônica de São Paulo in Britten’s War Requiem with Marin Alsop. “One of the most beautiful young lyric voices around”, according to Opera News – he returns to the Chamber Music Society of Lincoln Center, Philharmonia Baroque, the Philadelphia Orchestra, and to the Chicago Symphony – for Schubert’s Mass in E-flat with Riccardo Muti – as well as to the Toronto Symphony, appearing in the title role in Bernstein’s Candide. 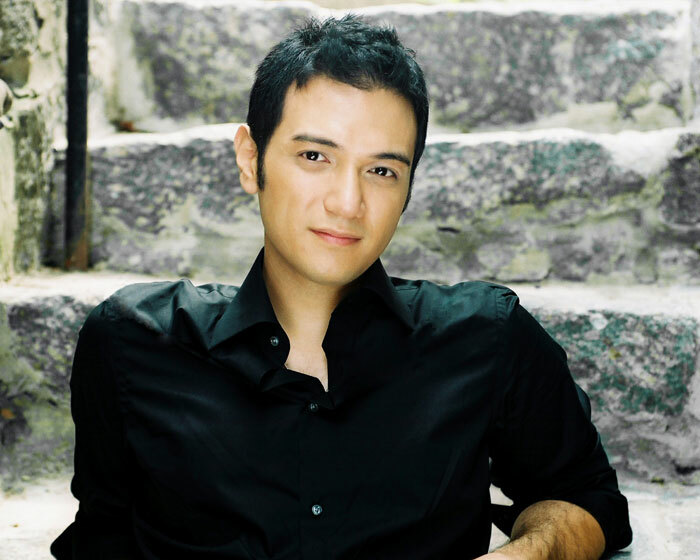 Mr Phan also serves as artistic director of two festivals next season: Collaborative Arts Institute of Chicago’s sixth annual Collaborative Works Festival, and will be the first singer to hold the title of guest Artistic Director of the Laguna Beach Music Festival. 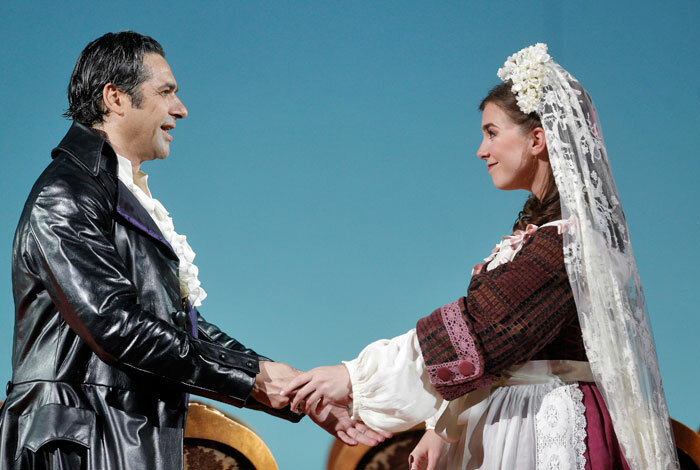 Bass-baritone Luca Pisaroni – “One of the Metropolitan Opera’s most dependably exciting performers …” says Time Out New York – was most recently seen here in San Francisco Opera’s 2015 production of Mozart’s The Marriage of Figaro. He opened the 2016-17 season as Leporello in Mozart’s Don Giovanni at the Berlin Staatsoper, a role in which he appeared in his debut performance at Teatro alla Scala earlier this month. Other role debuts during the season included those of Méphistophélès in Gounod’s Faust at Houston Grand Opera, and Giorgio in Bellini’s I Puritani at the Metropolitan Opera. Mr Pisaroni also sang Méphistophélès at the Wiener Staatsoper, as well as Conte Rodolfo in Bellini’s La Sonnambula. This appearance in Romeo and Juliet is one of many concert performances he’s made this season, mainly in European centers. Romeo and Juliet was first performed in three parts, at individual concerts, in November and December 1839. With Berlioz conducting an ensemble of 200 performers, they took place at the Salle du Conservatoire in Paris. The complete version of the work was performed in Vienna in 1846, and after more changes were made, Berlioz published the full score in 1847. Michael Tilson Thomas leads the San Francisco Symphony, soloists Sasha Cooke, Nicholas Phan and Luca Pisaroni, and the San Francisco Symphony Chorus, in Berlioz’s Romeo and Juliet at Davies Symphony Hall, from June 28 to July 1. For more information and tickets, visit the San Francisco Symphony website. It’s not often that ballet audiences who are not within reach of Covent Garden have an opportunity to see a full programme of works by one of the finest choreographers in British ballet history – Sir Frederick Ashton. Over the next couple of weeks, lovers of ballet around the world can see, in cinema, dancers of The Royal Ballet in an on-screen presentation of three classics from Ashton’s repertoire of more than a hundred works – The Dream, Symphonic Variations and Marguerite and Armand. Filmed within the past couple of weeks, during The Royal Ballet’s most recent season at The Royal Opera House, Covent Garden, these works amply demonstrate the wide-ranging artistry of this most celebrated of choreographers, and the consummate elegance of his creations. Undoubtedly one of the most influential figures in dance during his lifetime, Frederick Ashton is regarded as a principal architect of classical ballet in the 20th century. In 1935, he was appointed Resident Choreographer of the Vic-Wells Ballet by its Founder, Ninette de Valois, and developed the particularly English style which was to become the hallmark of the Company’s successor, The Royal Ballet, established in 1956, of which he was Founding Choreographer. In 1963 he took over as Director of The Royal Ballet and The Royal Ballet School, continuing to choreograph during his tenure, and also introducing to the Company a number of important works such as Nijinska’s Les Noces, Balanchine’s Serenade and a ballet which he commissioned – MacMillan’s Romeo and Juliet. Sir Frederick retired as Director in 1970 to concentrate on choreography, creating his last work, Rhapsody, ten years later. Ashton’s magical ballet The Dream premiered in 1964, as part of a program by The Royal Ballet to commemorate the 400th anniversary of the birth of William Shakespeare. Basing his ballet on A Midsummer Night’s Dream, and set to Mendelssohn’s incidental music for the Shakespeare play, Ashton created the roles of Oberon and Titania for Royal Ballet Principals Anthony Dowell and Antoinette Sibley, marking the beginning of their celebrated and legendary partnership. Symphonic Variations is regarded by many as Frederick Ashton’s greatest ballet. An abstract work of great elegance, it’s performed to César Franck’s Variations symphoniques for piano and orchestra by six dancers, who merge and part in a series of beautifully understated quartets, duets, sextets and solos. “It shows the absolute marriage between music and movement”, says Sir Anthony Dowell (former Director of The Royal Ballet), and accentuates the distinctive style for which Ashton was known. Symphonic Variations was premiered by the Sadlers Wells Ballet in 1946, at The Royal Opera House, Covent Garden, in a performance by Margot Fonteyn, Moira Shearer, Pamela May, Michael Soames, Brian Shaw and Henry Danton. The inspiration for Marguerite and Armand came from the play La Dame aux camélias by Alexandre Dumas fils, on which Verdi’s La traviata was also based. Set to Liszt’s La lugubre gondola and his Piano Sonata in B Minor, Ashton’s ballet was created in 1963, specifically for what was then the new partnership between Margot Fonteyn and Rudolf Nureyev. This highly emotional story is presented in a series of flashbacks as Marguerite, a Parisian courtesan, lies on her deathbed, recalling her tragic love affair with Armand. Included in the cast for the screening of these three Ashton works are Royal Ballet Principal dancers Sarah Lamb, Steven McRae, Marianela Nuñez, Vadim Muntagirov, Zenaida Yanowsky and guest artist Roberto Bolle. The Orchestra of The Royal Opera House is conducted by Emmanuel Plasson. The cinema presentation will be hosted by former Principal dancer of The Royal Ballet, Darcey Bussell, who will be joined by broadcaster Ore Oduba. The screenings take place in the Bay Area on June 28 and July 2, and to find your nearest cinema, follow this link. 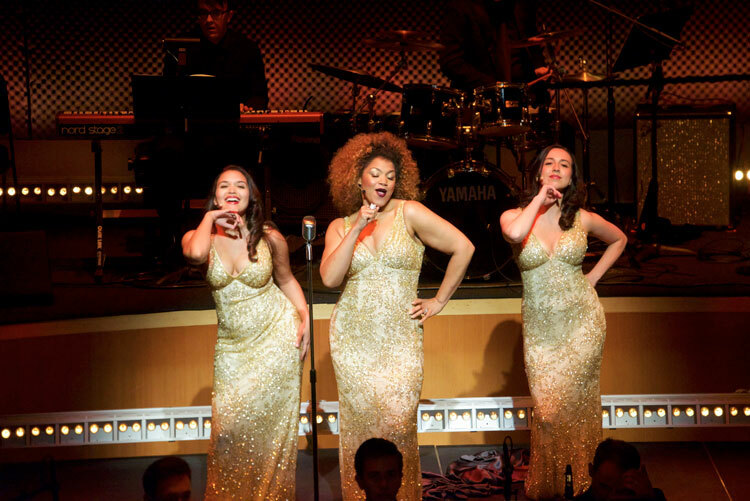 MTT & San Francisco Symphony turn on the razzle-dazzle! 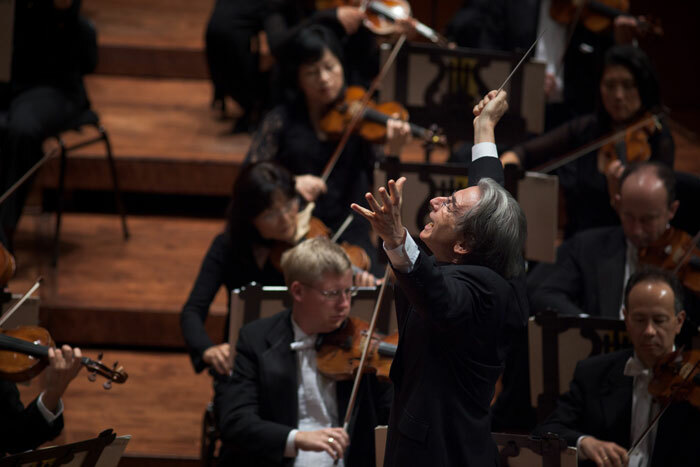 Michael Tilson Thomas and the San Francisco Symphony aren’t just thinking outside the box this week – they’re stepping right outside it as well! Their program Music for a Modern Age features unique audio-visual presentations of two works – the West Coast Premiere of Tilson Thomas’ song cycle Four Preludes on Playthings of the Wind, and George Antheil’s A Jazz Symphony. Also on the program are two works by Charles Ives – From the Steeples and the Mountains and The Unanswered Question – and Lou Harrison’s Selections from Suite for Violin with American Gamelan. MTT’s Four Preludes on Playthings of the Wind for Solo Soprano and Two Female Voices, Bar Band and Chamber Orchestra, is a musical setting of the satirical poem by Pulitzer Prize-winning author and poet, Carl Sandburg. Described by the Miami Herald as a mix of “art song, bebop and spiky modernism”, it was “inspired by the music making of Sarah Vaughan, Leontyne Price, James Brown, and Igor Stravinsky—all artists I had the privilege of knowing” says MTT. The work premiered on April 30, 2016, with Tilson Thomas leading the New World Symphony at the New World Center, Miami Beach, Florida. The Miami premiere featured the three vocalists who also appear with the Symphony in these first performances on the West Coast. The solo soprano is Measha Brueggergosman – described by esMadrid as “… young and extraordinarily talented ….. who could be considered the new Jessye Norman.” Also appearing are soprano Mikaela Bennett who recently made her professional stage debut as Penelope in John Latouche and Jerome Moross’s The Golden Apple, and mezzo-soprano Kara Dugan – praised by The New York Times for her “vocal warmth and rich character”. Both Ms Bennett and Ms Dugan make their San Francisco Symphony debuts in these performances. James Darrah – “a gifted young American director”, says the Chicago Tribune – directs Four Preludes on Playthings of the Wind, projection design is by Adam Larsen, and sound by Mark Grey. George Antheil’s A Jazz Symphony was composed in 1925 and premiered at Carnegie Hall on April 10, 1927. Compared by some to Gershwin’s Rhapsody in Blue – which had premiered in 1924 – it led to an interesting degree of rivalry between the two composers, but the similarity is scarce – the smooth influence of swing and the big band sound of Gershwin’s work contrasts significiantly with Antheil’s piece, reflecting the spirit of of jazz, Latin American and French modernist music, with a hint of Stravinsky. The staged version to be performed this week was, says MTT, “created in collaboration with legendary choreographer/director Patricia Birch, New World Symphony video artist Clyde Scott, and lighting designer Luke Kritzeck”, and premiered by Michael Tilson Thomas and the New World Symphony at the New World Center, Miami Beach, on October 11, 2014. These SF Symphony performances also feature the three artists who appeared in the premiere. 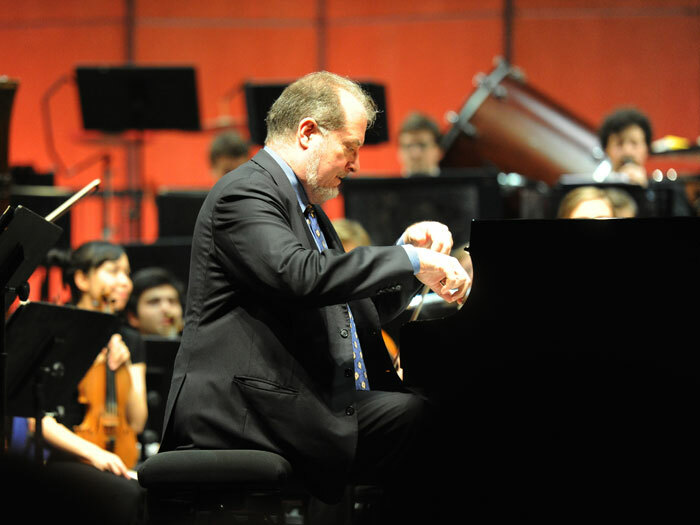 Pianist Peter Dugan – making his debut with the Symphony – was described as “a formidable soloist” by the Washington Post, following his recent debut at Kennedy Center with baritone John Brancy. He also appeared with violinists Itzhak Perlman and Joshua Bell in recent memorial concerts for Marvin Hamlisch. The dancers are Kiva Dawson and Erin Moore. Violinist Nadya Tichman is the soloist in Lou Harrison’s Selections from Suite for Violin with American gamelan, commissioned by the San Francisco Chamber Music Society and premiered in 1974. 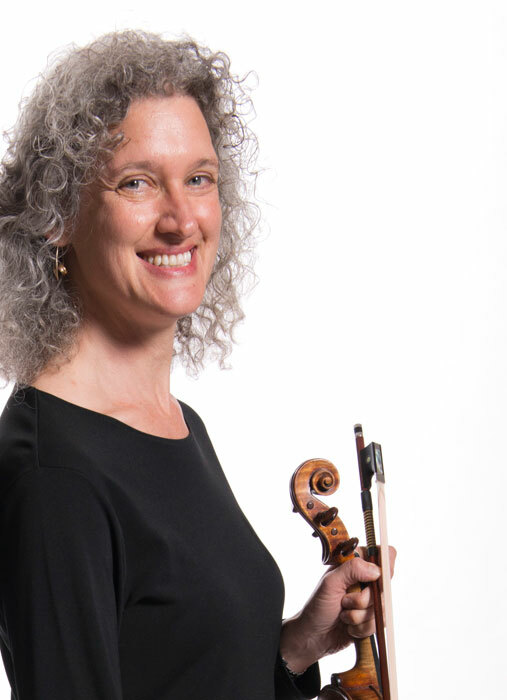 A long-standing member of the San Francisco Symphony, and Associate Concertmaster, Ms Tichman joined the Orchestra in 1980, and served as acting concertmaster from 1998 to 2001. She has collaborated in chamber music performances with artists as illustrious as Yo-Yo Ma, Yefim Bronfman and Garrick Ohlsson, and as a member of the World Orchestra for Peace, she performed in Geneva to commemorate the 50th anniversary of the United Nations. Program notes, by James M Keller, on the works by Charles Ives can be found on the following links: From the Steeples and the Mountains and The Unanswered Question. 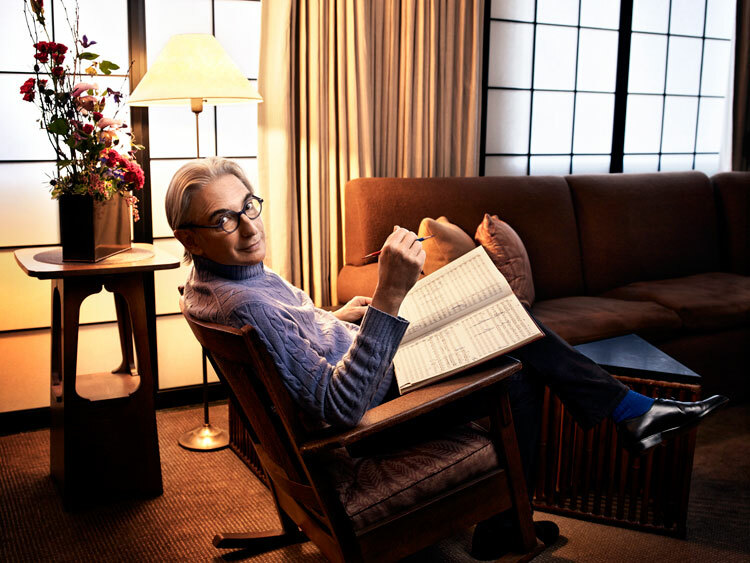 Michael Tilson Thomas leads the San Francisco Symphony and guest artists in Music for a Modern Age at Davies Symphony Hall on June 23, 24 and 25. For tickets and further information, visit the San Francisco Symphony website . The Stern Grove Festival, San Francisco’s traditional summer celebration of music and dance, opens at Sigmund Stern Grove on Sunday, June 25, this year celebrating its 80th season. The line-up features some favorite artists making a return visit, as well as a host of others, some of whom will be performing original pieces commissioned by the Festival for this event. 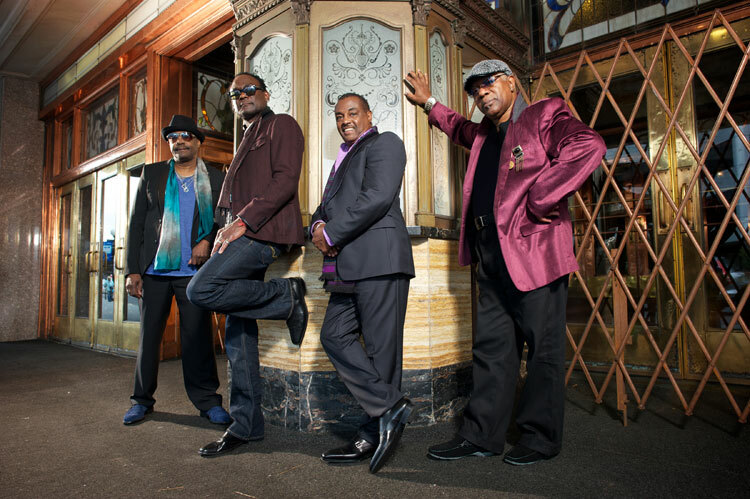 There is, as ever, a wonderfully diverse range of artists – from R&B group Kool & The Gang, to Eric Burdon with his powerful and distinctive voice, and the Malian and African music of Amadou & Mariam. Ibibio Sound Machine presents its combination of West African funk, disco, modern post-punk and electro music and there’s R&B and reggae group WAR. Moon Hooch are known for their dance-oriented percussion- and saxophone-based music; the Kev Choice Ensemble has a repertoire ranging from classical to jazz, as well as soul, rock and hip-hop; and Mavis Staples has been performing a repertoire which includes gospel, soul, folk, pop, R&B, blues, rock and hip-hop over the past 60 years. Latin music comes from Mexican group Los Ángeles Azules, exponents of Colombian cumbia music, who are are joined by singer, songwriter and fellow countryman Jay de la Cueva, by Ximena Sariñana – also from Mexico – and the Brazilian Girls, with their combination of reggae, jazz and bossa nova. 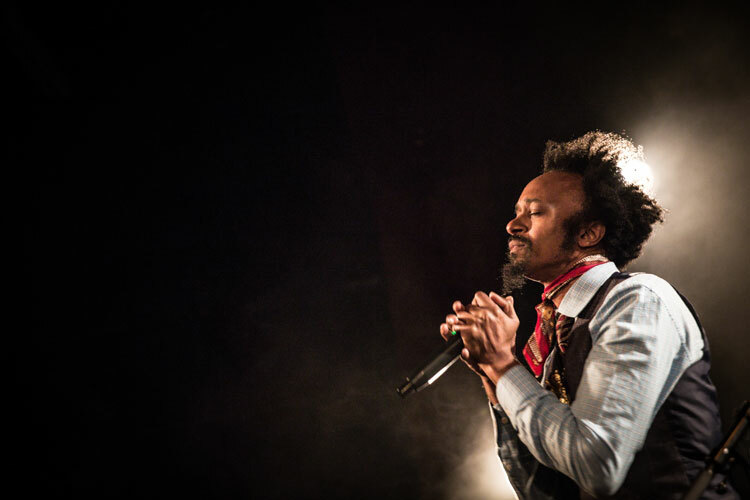 Local artists include Oakland-based Quinn DeVeaux, with his offering of R&B, modern soul and blues, and Fantastic Negrito – also from Oakland – the blues guitarist and singer who won this year’s GRAMMY for Best Contemporary Blues Album for his debut release The Last Days of Oakland. Nicki Bluhm and The Gramblers bring back memories of the music of California in the 70s with their blend of rock, country, blues and folk. The Stone Foxes have their own particular style of rock, contributing to the Summer of Love anniversary being celebrated in San Francisco this season, Ensambles Ballet Folklórico de San Francisco celebrate their 25th anniversary this season, and there’s Malo – a San Francisco-based group led by vocalist Arcelio Garcia Jr and guitarist Jorge Santana. 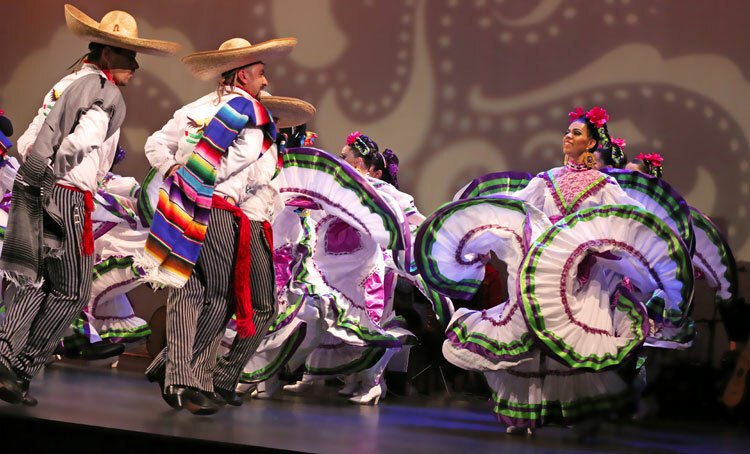 And for those whose passions in life are the classics and ballet, we have the Festival’s two classical partners – the San Francisco Symphony, and San Francisco Ballet. On July 9, the Symphony, led by Director of Summer Concerts, Edwin Outwater, presents a program of popular works, with guest artists soprano Jana McIntyre and baritone Hadleigh Adams. It includes selections from Mozart’s The Magic Flute, his Jupiter Symphony, music from Bizet’s Carmen, an arrangement – by Edwin Outwater – of Edith Piaf songs, and Ravel’s lovely La Valse. Conductor Outwater will be taking part in the pre-concert Artist Talk at Stern Grove’s Trocadero Clubhouse at 12:00 noon. San Francisco Ballet – Artistic Director Helgi Tomasson – performs a mix of classical and contemporary works from its current repertoire on July 30, and members of the company will also be participating in the Artist Talk at 12:00 noon in the Trocadero Clubhouse prior to the performance. 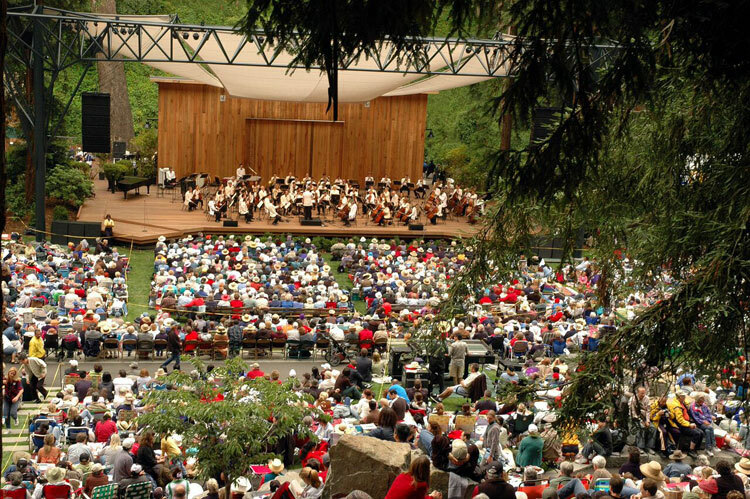 The Stern Grove Festival concerts are all admission free. Taking place at Sigmund Stern Grove, corner 19th Avenue and Sloat Boulevard, they run every Sunday, from June 25 to August 27, and start at 2:00 pm. 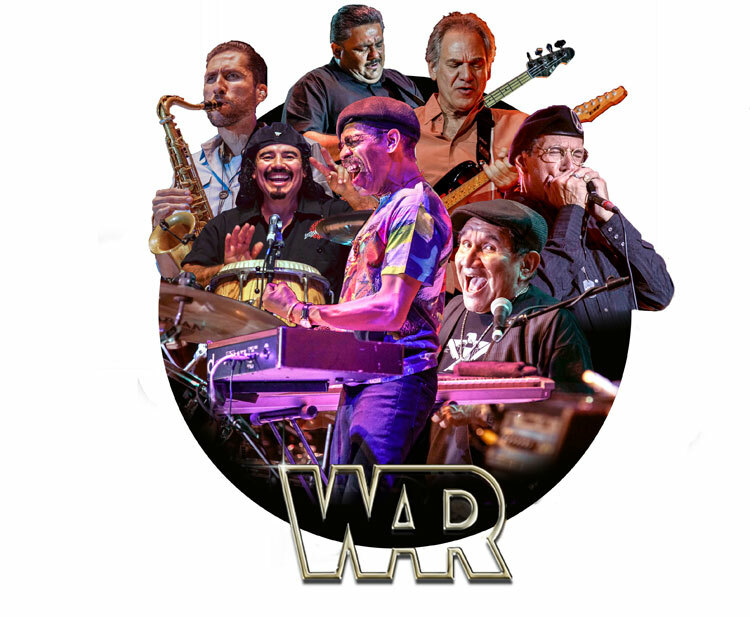 For more information, visit the Stern Grove Festival website. The presence of either Vasily Petrenko or Joshua Bell at Davies Symphony Hall would be enough to create a stir among San Francisco classical music enthusiasts, so to have both appearing with the San Francisco Symphony on the same bill is something of an occasion. This week, Maestro Petrenko leads the Symphony in program featuring Glinka’s Capriccio brillante on the Jota aragonesa – the first SF Symphony performance of this delightful piece. Guest artist Joshua Bell plays Lalo’s Symphonie espagnole – the most frequently performed of the composer’s works – and the program closes with Rachmaninoff’s Symphony No 1 – another welcome premiere performance for the Symphony. 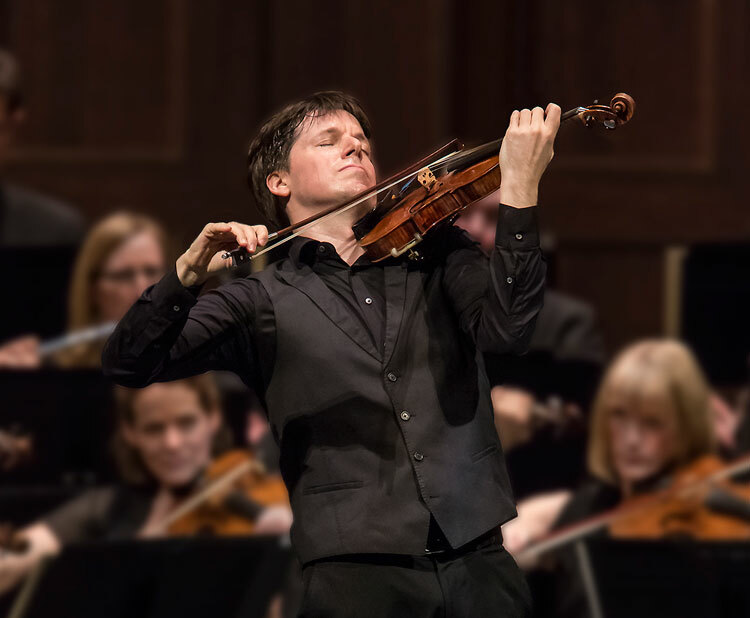 Joshua Bell, recognized as one of the most illustrious violinists of his time, is renowned as a soloist, chamber musician, recording artist and conductor. Recipient of the Avery Fisher Prize, and a number of Grammy, Mercury, Gramophone and Echo Klassik awards, he has appeared on television and film, and become the only person to hold the post of Music Director of the Academy of St Martin in the Fields, other than the late Sir Neville Marriner who founded the orchestra in 1958. Among the highlights of Joshua Bell’s 2016-17 season have been appearances in North America with Alan Gilbert and the New York Philharmonic, with Gustavo Dudamel and the Los Angeles Philharmonic, and with the Montreal Symphony and the National Arts Centre orchestras. In Europe he played with the Vienna Philharmonic, Leipzig Gewandhaus, Frankfurt Radio Symphony and Czech Philharmonic orchestras, and undertook tours with the Academy of St Martin in the Fields in the United Kingdom, and to the Benelux countries, Germany and Australia. Mr Bell also appeared with the Verbier Festival Chamber Orchestra in Switzerland, toured European centers with the Swedish Radio Symphony, and appeared in Korea and Japan with the Orchestre de Paris – both tours led by Daniel Harding. He was also the 2016-17 artist in residence at the Kennedy Center in Washington D C with the National Symphony Orchestra. Having recorded more than 40 albums during his career, Joshua Bell will, in August, be releasing a new collection of 14 CDs on the Sony Classical International label – a selection from the violin concerto repertoire, chamber music and concert pieces, all of which he has recorded on this label over the past 20 years. Included in this collection are works ranging from his 2008 recording of Vivaldi’s Four Seasons to his 2014 album, Bach; also Romance of the Violin and Voice of the Violin – two of his most popular releases; the 1993 violin concerto written for him by Nicholas Maws, The Red Violin Concerto and Leonard Bernstein’s West Side Story Suite, as well as masterpieces by Beethoven, Mendelssohn, Tchaikovsky, Brahms, Gershwin, Ravel and Sibelius. 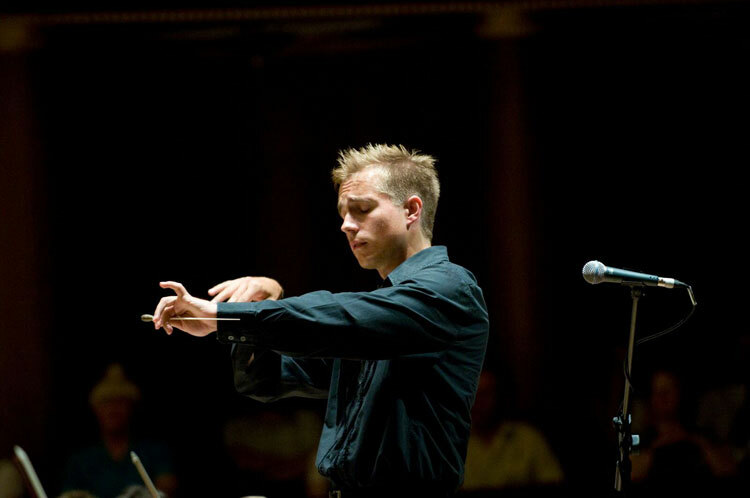 Currently Chief Conductor of the Royal Liverpool Philharmonic, and of the Oslo Philharmonic and the European Union Youth orchestras, Vasily Petrenko is also Principal Guest Conductor of the State Academic Symphony Orchestra of Russia “Evgeny Svetlanov”. He has served as Principal Conductor of the National Youth Orchestra of Great Britain and of the Mikhailovsky Theatre (formerly the Mussorgsky Memorial Theatre of the St Petersburg State Opera and Ballet), where – as Resident Conductor – he started his conducting career in 1994. Appearing with some of the world’s most prestigious orchestras, with frequent appearances at the BBC Proms, he also has a wide repertoire in the world of opera, having led performances of MacBeth at Glyndebourne Festival Opera, Eugene Onegin at the Opéra de Paris, Pique Dame at Hamburg State Opera, Eugene Onegin, La Bohème and Carmen at the Mikhailovsky Theatre, Carmen at the Zurich Opera, Tosca and Parsifal with the Royal Liverpool Philharmonic, and Der fliegende Holländer with the Oslo Philharmonic . Vasily Petrenko leads the San Francisco Symphony in works by Glinka, Lalo and Rachmaninoff, with guest artist Joshua Bell, from June 15 to 18 at Davies Symphony Hall. For more information and tickets, visit the San Franciscso Symphony website. 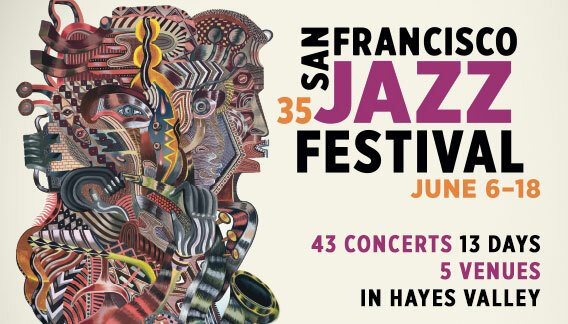 Now into its second week, the San Francisco Jazz Festival is still drawing crowds to the Miner Auditorium and Joe Henderson Lab at SFJAZZ – and since this hugely popular event runs until Sunday, there’s still time to get the Jazz Center and revel in some of the finest music-making around. Highlights in the Miner Auditorium this week include saxophonist, composer and bandleader Chris Potter – “one of the most dynamic young players in jazz” (Chicago Tribune) and the Chris Potter Quartet – in a double bill with tenor saxophonist Melissa Aldana – winner of the 2014 Thelonious Monk International Jazz Saxophone Competition. Four-time Grammy-winning bassist and composer Stanley Clarke is the star turn on Wednesday. Described by The New York Times as “a fleet-fingered marvel with a particular gift for funk”, he appears with Beka Gochiashvili on piano keys, Caleb Sean McCampbell on keyboards, and drummer Michael Mitchell. Five-time GRAMMY-winning drummer and composer, Antonio Sánchez, well known for his score to Birdman – winner of the 2015 Academy Award for Best Picture – and for his long-time collaboration with guitarist Pat Metheny, appears with the Migration quartet, with whom released the 2015 album The Meridian Suite. Also on the bill, is Donny McCaslin and his Quartet who featured on David Bowie’s last album, Blackstar, and for whom Bowie was the inspiration for McCaslin’s latest album Beyond Now. Bokanté, “One of the more versatile groups on the planet right now”, according to Rolling Stone, comprises eight musicians from four continents – two-time Grammy award-winning guitarists Michael League, Chris McQueen, and Bob Lanzetti (all from Snarky Puppy), legendary percussionist Jamey Haddad (Paul Simon, Sting), pedal and lap steel virtuoso Roosevelt Collier (Lee Boys, Karl Denson), and percussionists André Ferrari (Väsen) and Keita Ogawa (Banda Magda, Yo-Yo Ma). They’re on stage in the Miner Auditorium on Friday. The last two performances of the Festival in the Miner Auditorium are given over to a program entitled Dance to the Music, featuring Bay Area-based Con Brio – “The best new live band in America”, says PopMatters. Having appeared at most of the major American music festivals in the second half of last year, they also took in performances at festivals in Montreal, Japan, Rotterdam, London and Paris – and this year they’re flying high, with plenty more international engagements. In the Joe Henderson Lab, bassist Derrick Hodge – who’s worked in the fields of jazz, cinema and R&B music – is joined by Mike Mitchell on drums this evening. Ambrose Akinmusire, “…a fiercely gifted young trumpeter” (The New York Times) follows, with music from his newest release, A Rift in Decorum: Live at the Village Vanguard. According to the Los Angeles Times, bassist bandleader Linda May Han Oh is “Proof that Esperanza Spalding is not the only female bassist-bandleader worthy of acclaim”. Her group is in the Joe Henderson Lab on Friday. Gypsy jazz meets the Beatles is the title of Saturday’s performances in the Lab by The Hot Club of San Francisco: John, Paul, George and Django – and ticket sales have been so brisk that SFJAZZ has added a third performance to the roster that evening. The final Festival performance in the Joe Henderson Lab is headed up by pianist and composer Jon Jang with his quartet in a program entitled Can’t Stop Cryin’ for America: Black Lives Matter! Described by All About Jazz as “A modern day visionary who draws upon his Asian heritage as a source for inspiration and musical implementation”, this Bay Area artist presents what’s described as a project-in-progress devoted to the young black Americans who have recently lost their lives in violent circumstances. For more information on the San Francisco Jazz Festival, and for tickets, visit the SFJAZZ website . 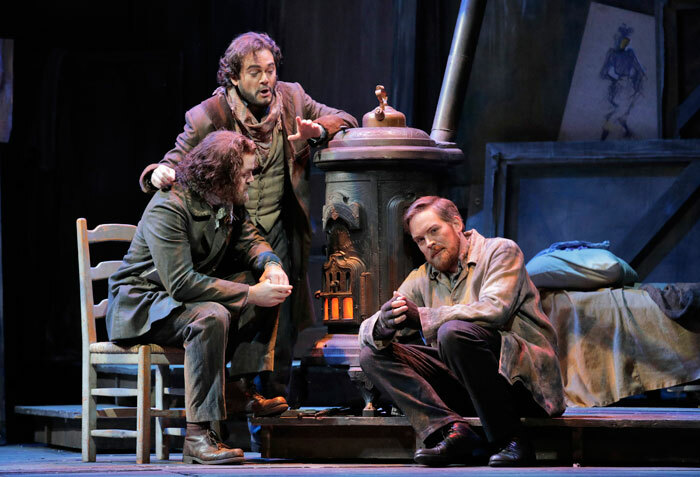 San Francisco Opera opens the final production in its summer season this weekend with one of the world’s most popular operas, Giacomo Puccini’s La Bohème. 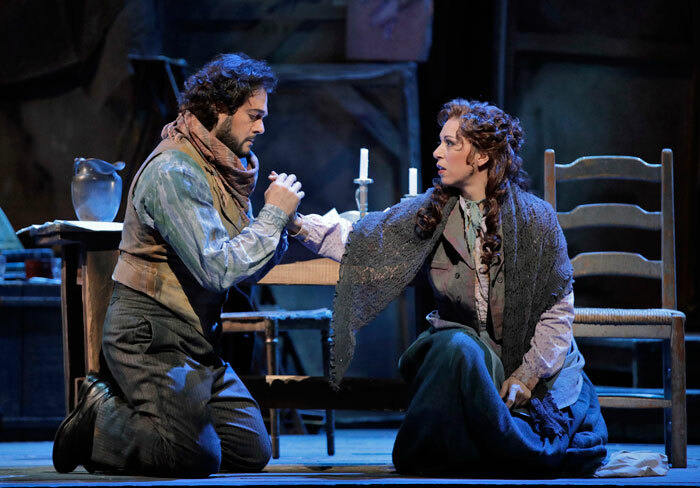 This passionate and heartbreaking portrayal of love in the bohemian quarter of 19th century Paris brings to the stage of the War Memorial Opera House some of the most beautiful music ever written. 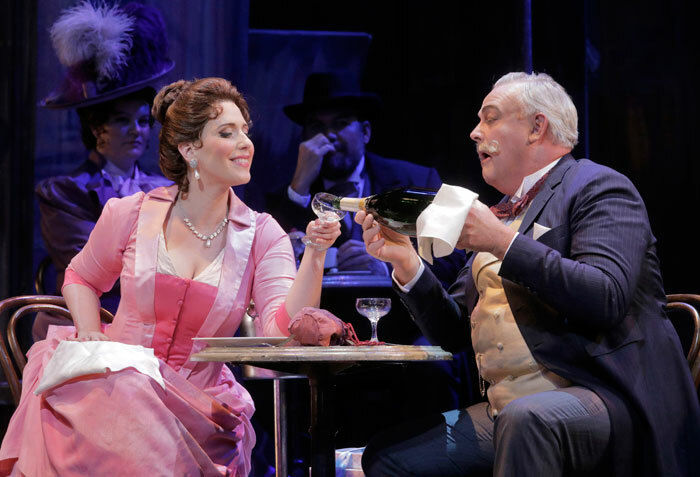 Carlo Montanaro conducts this co-production with Houston Grand Opera and Canadian Opera Company, which has sopranos Erika Grimaldi and Julie Adams sharing the role of Mimi, tenor Arturo Chacón-Cruz as Rodolfo, and soprano Ellie Dehn as Musetta. 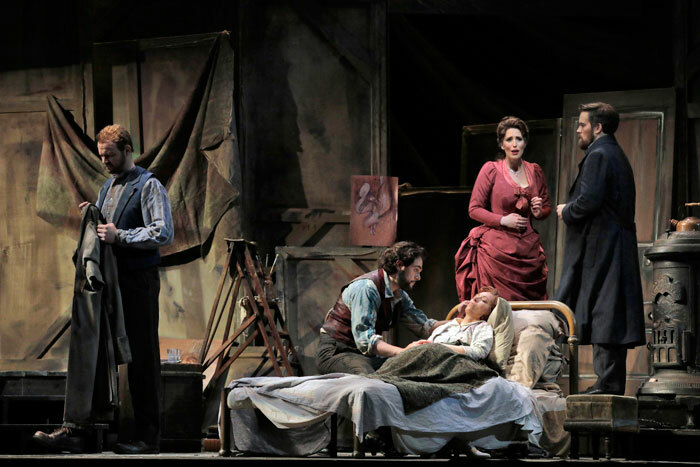 La Bohème – with a libretto by Luigi Illica and Guiseppe Giacosa – was written in 1895, and first performed in Turin on February 1, 1896. The opera was based on a novel by French novelist and poet, Henri Murger – Scènes de la vie de bohème – in which he wrote about a lifestyle which he new intimately. He himself figured as Rodolfo in the book, and the other characters were all friends of his – students who were fun-loving and witty, with a healthy disregard for authority, but whose lives were also tempered with sadness. 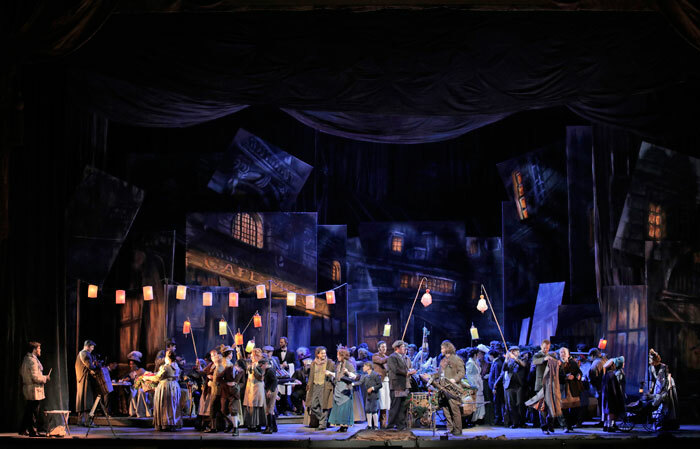 This staging of La Bohème, a revival of San Francisco Opera’s 2014 production, is by English director John Caird – winner of two Tony Awards, a Lawrence Olivier Award, a Drama Desk and three Outer Critics Circle awards. He is an Honorary Associate Director of the Royal Shakespeare Company, and Principal Guest Director of Sweden’s Royal Dramatic Theatre (Dramaten) in Stockholm. His list of productions includes highly successful shows such as Beggar’s Opera, Candide, Les Miserables, The Life and Adventures of Nicholas Nickleby, Stanley and Daddy Long Legs, and he’s also the author of Theatre Craft, A Director’s Practical Companion from A to Z. The design is by Olivier Award-winning artist David Farley – who also has an Evening Standard and a Critics Circle award to his credit – and whose portfolio boasts an extraordinary number of successful productions, including A Little Night Music, Daddy Long Legs, Sunday in the Park with George, Oklahoma and La Cage aux Folles. 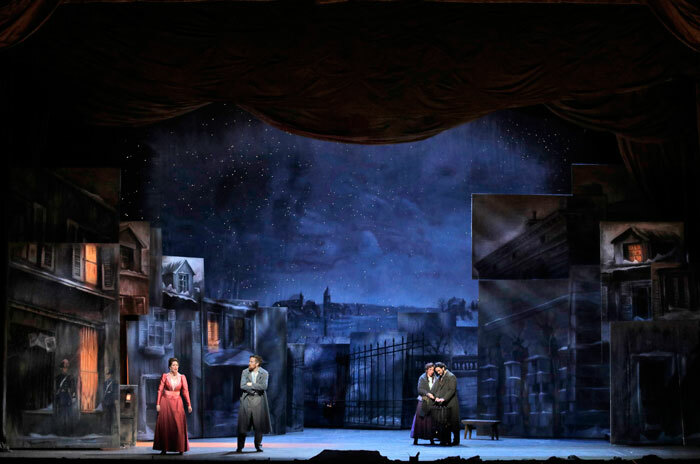 His gorgeous sets for this staging of La Bohème include a fascinating collage of canvases inspired by scenes of Belle Époque Paris. Italian soprano Erika Grimaldi was offered the role of Mimi in La Bohème almost immediately after she won First Prize at the Comunità Europea competition in 2008. Since then she has sung the role at Opera de Oviedo in Spain, the Savonlinna Festival in Finland, at Teatro di San Carlo in Naples, and at Teatro Regio in Turin. She has appeared in a number of other roles at major opera houses such as Teatro dell’Opera di Roma, Bayerische Staatsoper in Munich and Opéra National de Montpellier. Ms Grimaldi made her debut with San Francisco Opera in the Company’s 2016 production of Bizet’s Carmen, singing the role of Micaëla. 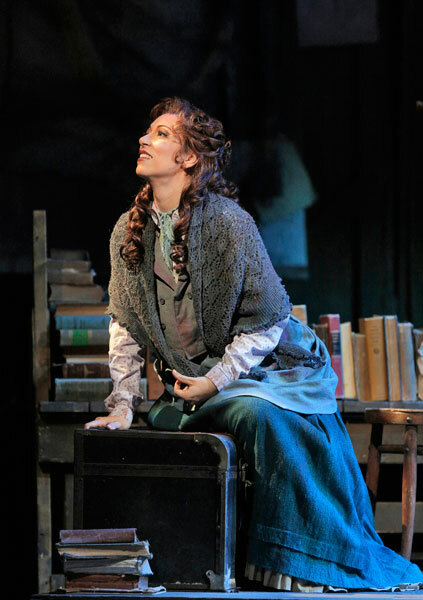 Two performances of La Bohème – on June 20 and 25 – will feature American soprano Julie Adams in the role of Mimi. A former San Francisco Opera Adler Fellow, Ms Adams was a winner of the 2014 Metropolitan Opera National Council Auditions, won the 2015 George London Award, the 2015 Elizabeth Connell prize for aspiring dramatic sopranos, and was a recipient of a 2015 Sara Tucker Study Grant. This 2016-17 has also seen her appear as Kate Pinkerton in Madama Butterfly, Kristina in The Makropulos Case, and she covered for the role of Princess Jia in the world premiere of Dream of the Red Chamber for San Francisco Opera. Next season she’ll return as a guest artist in Francesca Zambello’s production of Wagner’s Der Ring des Nibelungen, singing Freia in Das Rheingold and Gerhilde in Die Walküre. Mexican tenor Arturo Chacón-Cruz appears as Rodolfo, a role he’s previously sung in Berlin, Bologna, Munich, Stockholm and Moscow. 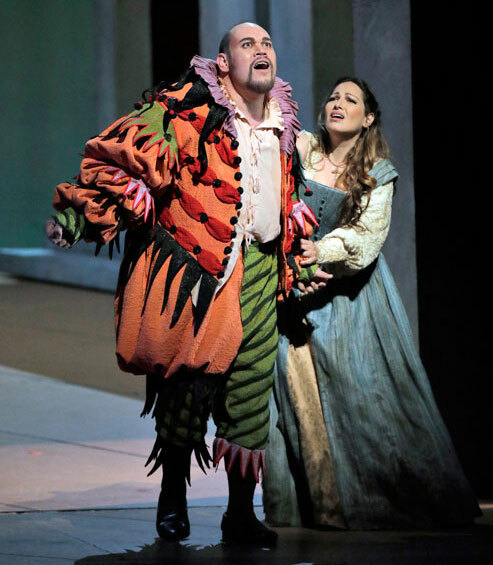 He made his first appearance with San Francisco Opera as the Duke of Mantua in the company’s 2012 production of Verdi’s Rigoletto – a debut described by the San Francisco Chronicle as one of “enormous grace, charisma and stamina”, adding “Here, clearly, is a singer of major promise.” The 2005 winner of Plácido Domingo’s Operalia Singing Competition, Mr Chacón-Cruz has acquired a repertoire which includes not only Rodolfo and the Duke of Mantua, but Alfredo in Verdi’s La Traviata, Pinkerton in Puccini’s Madama Butterfly, the title roles in Les Contes d’Hoffmann and Massenet’s Werther, and Romeo in Gounod’s Roméo et Juliette. Ellie Dehn, who made her debut with San Francisco Opera in 2010, has been described by The Wall Street Journal as “a charismatic soprano with great stage presence and a voice combining metallic clarity and sensual richness.” According to The New York Times, she “possesses a beautiful, bronzed and rich soprano”. Acclaimed for her versatility, Miss Dehn has appeared in many of the world’s finest opera houses, including the Metropolitan Opera, Teatro alla Scala, The Royal Opera House, Covent Garden, Bayerische Staatsoper, Los Angeles Opera, Houston Grand Opera, Santa Fe Opera and Santa Cecilia. Norwegian baritone Audun Iversen is Marcello, Colline is sung by Scott Conner, Brad Walker – a current San Francisco Opera Adler Fellow – is Schaunard, and Dale Travis – who has appeared with San Francisco Opera in fifteen seasons since 1988–89 – sings the roles of Benoît and Alcindoro. Conductor Carlo Montanaro – music director at Teatr Wielki in Warsaw from 2011 to 2014 – made his debut with San Francisco Opera in the 2016 production of Bizet’s Carmen. His operatic repertoire also includes Lucia di Lammermoor, Nabucco, Aida, Tosca, La sonnambula, Il barbiere di Siviglia, Madama Butterfly and La Bohème, and he has led performances in many of the opera houses in his native Italy, such as La Scala, Milan, Teatro dell’Opera in Rome, the Teatro Massimo in Palermo, the Arena di Verona, the Fondazione Arturo Toscanini in Parma, the Teatro Verdi in Trieste, dell’Accademia Nazionale di Santa Cecilia in Rome and the Teatro Comunale in Florence. He has also appeared at major venues such as Deutsche Oper in Berlin, Opéra de Monte Carlo, Opéra Bastille in Paris, the Mariinsky Theatre in St Petersburg, the Israeli Opera in Tel Aviv, the New National Theatre in Tokyo and Sydney Opera House. Carlo Montanaro leads the San Francisco Opera Orchestra and Chorus (Director Ian Robertson), and members of the San Francisco Girls Chorus and San Francisco Boys Chorus, in Puccini’s La Bohème. The San Francisco Girls Chorus is led by Artistic Director Lisa Bielawa and Music Director and Principal Conductor Valérie Sainte-Agathe. The San Francisco Boys Chorus is led by Artistic Director Ian Robertson. Sung in Italian with English supertitles, performances take place at the War Memorial Opera House from June 10 to July 2. For more information and tickets, visit the San Francisco Opera website. Finnish conductor Susanna Mälkki leads the San Francisco Symphony this weekend in a program featuring two works by Stravinsky – his Scherzo fantastique and Le sacre du printemps (The Rite of Spring) – and piano virtuoso Garrick Ohlsson plays the Beethoven Piano Concerto No 1. Garrick Ohlsson is no stranger to San Francisco audiences, having debuted with the Symphony in 1972 and made many welcome return visits. He is described by the music critic of the Southern California News Group as “a uniquely gifted pianist”. The Telegraph writes that his style “is rich and full”, and the Seattle Times refers to his “incredible technique with razor-sharp accuracy, producing a sound so lush it almost glistens”. Susanna Mälkki has been described by The Wall Street Journal as “one of the brightest lights in the world of classical music”, and according to a review in The Chicago Tribune, she “has an uncommon ability to create the appropriate sound picture around every score she conducts. Such was her refinement of detail that one could hear and appreciate everything that went on beneath the shimmering surface”. Currently Chief Conductor of the Helsinki Philharmonic Orchestra, and Principal Guest Conductor of the the Los Angeles Philharmonic and the Gulbenkian Orchestra in Portugal, Ms Mälkki was previously music director of the Ensemble InterContemporain, and artistic director of Stavanger Symphony Orchestra. In addition to Ms Mälkki’s symphonic achievements, highlights of her 2016-17 season in the world of opera were her debut with the Metropolitan Opera conducting the first company performances of Kaija Saariaho’s L’Amour de loin, and she made a return visit to Opéra National de Paris for the world premiere of Luca Francesconi’s new work Trompe-la-mort. Susanna Mälkki has also been nominated for a 2017 Nordic Council Music Prize – one of two nominees from Finland. The winner will be announced and the award will be made at the Finlandia Hall in Helsinki on November 1. 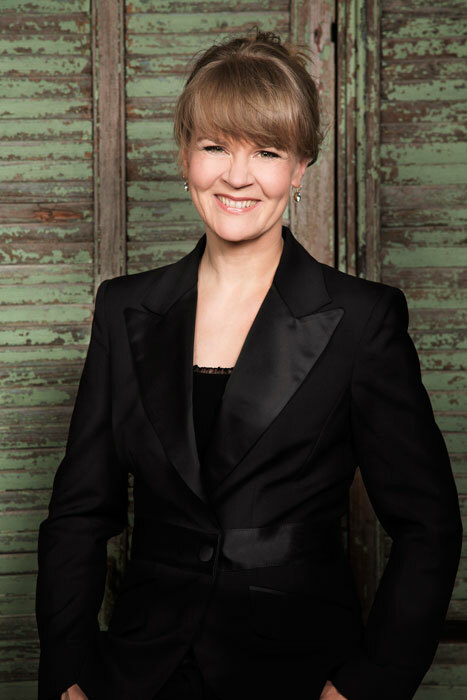 Susanna Mälkki leads the San Francisco Symphony, with guest pianist Garrick Ohlsson, in a program of music by Stravinsky and Beethoven at Davies Symphony Hall on June 9, 10 and 11. For more information and tickets, visit the San Francisco Symphony website. ArtsPreview is a showcase for the performing arts, focusing mainly on productions in San Francisco, but also featuring those taking place in major centers around the world. If you would like to receive regular updates of the latest articles from Preview, please let us know via email.